I have just ascertained that General E. Kirby Smith issued an order pardoning the men who deserted from his army when ordered across the river. This after I had captured most of the deserters. Under these circumstances it seems to me to be useless to send further orders to cross the troops. Signed R. Taylor Leuit. Genl. Has ascertained that Genl. 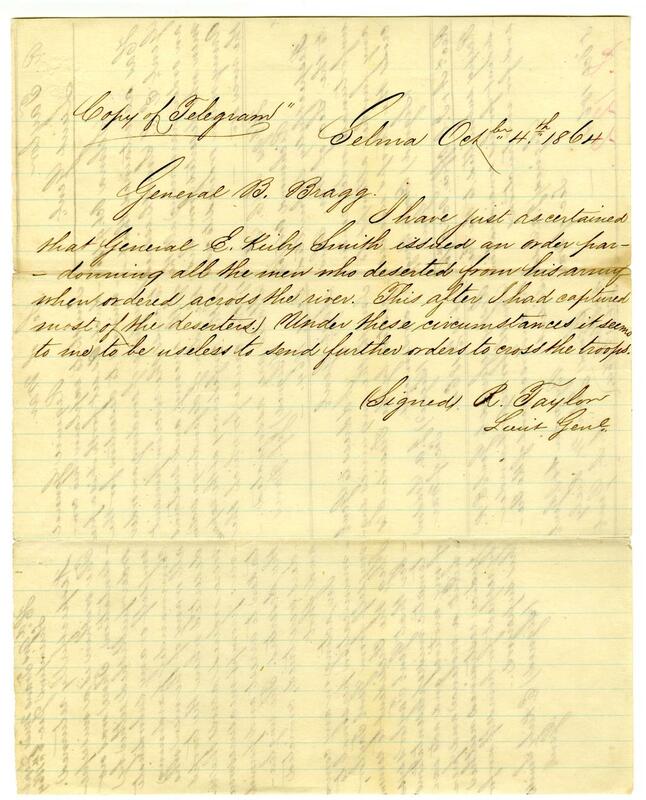 E. K. Smith issued an order pardoning all the men who deserted from his Army when ordered to cross the river etc. Respectfully submitted to the Sec. of War. This unfortunate order renders and further attempt to cross the troops useless. Reply submitted to the President for his consideration and for instructions. Address to Genl. Smith the inquires suggested by the President’s endorsement. Respectfully returned. The within is a misrepresentation. There was no order published either by myself or any subordinate commander pardoning all or any of the men who deserted when the troops were ordered across the river: prompt me as assures were taken to arrest and punish the deserters. The ring leaders were tried, convicted, and shot. In acting on any communication personal to myself from Genl. Taylor, I bet the President to remember that Genl. Taylor’s systematic misrepresentations of my motives and acts exhibit a violence and prejudice restrained neither by respect for himself nor for his superiors. (Signed) E. Kirby Smith Genl. 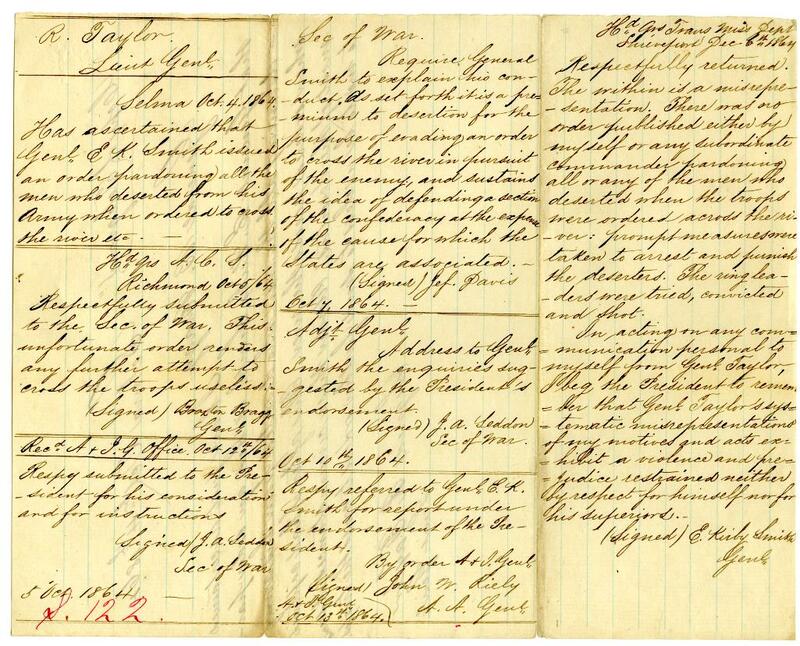 This entry was posted in Southern Historical Collection and tagged Civil War, Conferderate Army, deserters, General E. Kirby Smith, Pardon, punishments, telegrams. Bookmark the permalink.